The Vol. 10x, No. 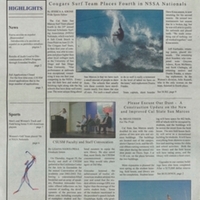 1 issue of The Pride features the Cougars Surf Team and the ongoing construction of the campus. 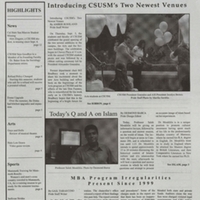 Digitization funded by the California State University San Marcos 25th Anniversary Committee and the University Library. Please note: Because of their size, some of the newspaper files may take time to load into the image viewer. These files may be downloaded to your personal device for off-line reading provided all copyrights are observed. 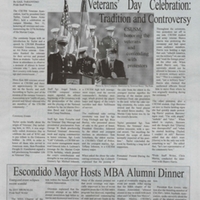 Click here to contact the CSUSM Archives about this site.